Luckily today, many young persons have taken up the courage, braving the stumbling blocks and coming out of their shelf into a world where only the fittest survive. In view of the National Women’s Day 2019 in Cameroon, some vision driven young ladies organized a seminar themed YOUNG WOMEN OF SIGNIFICANCE CORPORATE EVENT, where they gave inspiring talks to their fellow young ladies who aspire high but are still beaten by the general societal restraints on the capabilities. On the 9th of March 2019, these young ladies, Nulah Sylvie Kuna, founder of InspireHER Network, a Professional in Women and Gender Studies/Law, a Women Empowerment Strategist, a Social Entrepreneur, The Assistant Programs Manager at C-life and a C-life Servant Leadership Fellowship Training Program Alumni and Fawoh Nancy, Co-Publisher, LeGideon Newspaper, dished out talks that centered around how they have fought their way out of the local mindset into a global and intellectual way of reasoning. According to Nula Sylvie, thriving in the corporate world as female demands a lot of courage, hard work, determination and bravery, since men and women are on the same relay line of life but women having roadblocks like; housework, child-bearing, their husbands before their job to take care of. Due to the feminine nature of the woman, the society sees women as fragile and therefore tend to minimize their strength, added Sylvie, saying that before judging a woman biologically, she should first be looked at from her interior- what she can offer. Looking at the nature of women and for the fact that they must find and own a space in society, Sylvie has come up with four key ways of thriving in the corporate world. For Sylvie, women should prioritize networking and not shy away from men’s world, rather, they should ask questions or join the men in their activities for better energetic skills. Also, Sylvie holds that women should stay feminine in their actions, using their feminine qualities like; verbal, intuitive and emotional skills to better fit in the corporate world. Since women have a lot to take care of, they face the problem of time management. Sylvie, therefore, calls on women to maximize time in order to better meet up with their tasks. She further calls on women to be intentional in their actions, doing things the way they ought to be done and not to please others. This, she said, is because women are often misquoted, and their feminine nature is taken for weakness. Fawoh Nancy, another young Cameroonian lady of significance, breaking records in the corporate world. Taking her personal story as an inspiration for young Cameroonian ladies, Nancy gives a fascinating talk on her seven formulated corporate growth skills for young women. According to Nancy, since one could find herself in a field of work that she didn’t study, it is important to study and master the work where one finds herself, as this will help contribute to the growth of that field. Ignorance of one’s field of work is the beginning of failure, as such, one must stay updated, given that employers will always expect more from their employees. To this, Nancy reaffirms that it is, therefore, necessary for one to network with people of the same field, so as to better update their work status. In addition, Nancy holds that one should make herself indispensable, working so hard that the company cannot stand losing them. This, to her, creates an impact of you on the company, and so makes you an asset in that field of work. Looking presentable (smart and descent) plays a great role in the corporate world, Nancy states. Therefore, she adds, the way you look plays a big role not only on you but on the people with whom you work as well. Looking at the corporate world, one needs to be persuasive enough for your view to be considered. As such, Nancy thinks that one must be a good negotiator and seller of the company they represent, making sure that the affairs of the field are not contradicted with personal affairs. Taking account of the rapid technological advancement, Nancy says that one must be versed with technology, making good use of the different social media platforms with credibility. To crown her words, she mentions the fact that prayers have been the secret to her success story and so, she strongly believes that one should always pray to God in every endeavour and be patient. 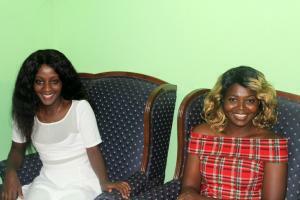 Cameroon needs more vision-driven young women like Nulah Sylvie and Fawoh Nancy for a change in the mindsets of youths and the advancement of the society. Young women must, therefore, crack their way out of the shell of ignorance and backwardness, lest they miss out their dreams.